I'm sure you all are waiting for the next epic update in my groundskeeping saga. First of all, the outside of the baseball field did not actually die. It just remains a slightly different color. 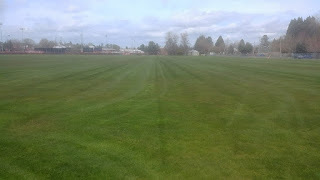 Wednesday I mowed the practice field. This is around ten acres and I use a 14ft batwing Bush Hog mower. I didn't take the photo of the mower. I took it of the field. It generally takes four to five hours to mow the field. This is my second year of mowing it. Last year we had so much rain in the spring it was very difficult to mow. I just kept getting more piles of grass and it was too soft to pick the grass up. This year the fellow who walks across the field to come to work started driving and so he didn't scare the geese off the field every day. They have kept much of it mowed short. 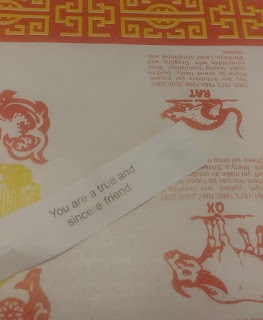 This is good for me. I mowed in a record four hours. The field is rough and soft. Every time you mow you leave ruts. My dear leader plans on renting a large roller and rolling it flat. I tend to think rolling fields leads to compaction but I do not have a background in groundskeeping. We shall see. I applied for a job at another small college. It is the college I graduated from. It is twenty minutes from home. On a good day. However, trip home could take an hour due to commuters from Portland. They offered me more money but less retirement. I asked for a lot more money, the supervisor said he thought they could do it and would call me tomorrow morning after he talked to his supervisor, they countered that evening with a little more but I didn't take it. If he would have offered $1000 more I would have taken the job even though I had decided ahead of time my bottom line. That school is growing, has a marketing focus, the grounds supervisor is a working supervisor and everyone in the department was all excited about their plans. Plus, they do not have a wage freeze. The last time I posted I think I talked about planting 90 acres of radish for my neighbor. It didn't come up. He called me yesterday and said I planted it too deep. I offered to replant it. However, he came in after I no-till the ground (which actually tills it up quite a bit) and planted red clover and so he doesn't want it worked up again. I think what happened was that it rained hard after I planted and all the loose soil in the seed trench turned to mud and buried the seed. I was actually worried about planting too deep as there were radish seeds on top of the soil in places. Then when he planted clover over the top it buried it more. This is a bad deal as it is close to a $3,000 job. Probably $180 in diesel plus I took off work and also worked all day Sunday to do it. My daughter has been accepted into a summer workshop for young writers in Virginia. This is going to be expensive and she is going to miss prime baling season. I encouraged her to do it even though she had decided not to go as she now wants to be a nurse. I don't know if I did the right thing. Not sure how to pay for it. Tomorrow I'm supposed to go to lunch with the pastor of the church we have been attending. I was supposed to meet him last Wednesday and I got to the crappy Chinese restaurant and he forgot. Pretty sad when your potential pastor stands you up. Perhaps he thinks he's already got me. I didn't tithe today. Plus, I spiked his survey with requests for sermons discussing irresistible grace and predestination of the elect, or whether our belief in God is evidentiary or experiential, and if the existence of Alien life should cause us to question our spirituality. I wish I would have thought to request more hymns cause I find worship team music really boring. Often my daughter and I amuse ourselves by getting my cousin's really nice wife to laugh while singing. My nephew from the big city has been working for my brother in the shop though spring break. He went to Church with us this morning. Possibly because there was food. It was nice. He is a decent kid. Took my daughter shooting Saturday. She doesn't see the point in shooting. The exploding paint cans were cool but she was not much into blazing away at already dead cans and wasting money on ammunition. It could be her age... However, I found myself not as thrilled as I once was. I've got offers on my semi scary gun and its a matter of just doing the paperwork at my neighbor's backyard gunship and I will have a little extra pocket money. Think I'll give part of it to the Oregon Firearms Federation. We are going to get severe gun control in Oregon. It might be worth changing jobs just to get away from the foolishness you describe there! Gun control in Oregon? Soon you will be as bad as Canada. Target practice does not appeal much to me. I usually only shoot to kill :-) Thinking about you cutting grass on soft ground while I shovel snow on frozen ground. Well not quite, as I'm trying to be lazy and waiting for the sun to melt it. Can't be much longer now. The writer' workshop would be great. I did not follow the link because I didn't want to. If I did not live 1500 miles away I'd help bale because I see no point in what I'm doing now. It won't stop snowing here.